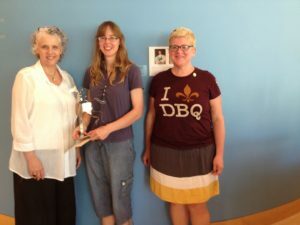 The Dubuque County Fine Arts Society awarded $1000 in cash prizes to three exhibiting artists who exhibited their work in the 2013 DubuqueFest Art Fair held May 17 & 19 in Washington Park in downtown Dubuque, Iowa. 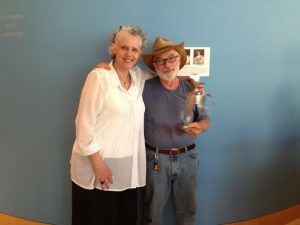 The artists were recognized at a reception held on Saturday, May 18 at the Dubuque Museum of Art. Three Artist Awards were granted: Best in Show (cash prize of $500), Second Place ($300), and Third Place ($200). The goal of the annual DubuqueFest Artist Awards is to reward the work of art fair vendors and provide economic reward to cultural workers across the region. Artist, Arts Advocate, and Co-owner of Outside the Lines Art Gallery Connie Twining served as Art Fair Judge. 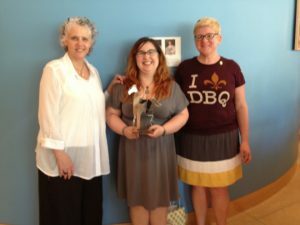 The awards were announced at the DubuqueFest Art Fair’s annual Artist Awards Reception, hosted by Art Fair Director Paula Neuhaus at the Dubuque Museum of Art. 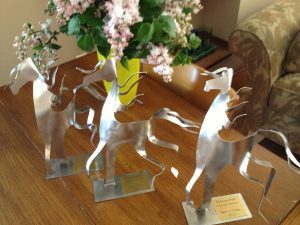 The evening offered cash awards, delicious food by East Mill Catering, wine by Miss Kitty’s Grape Escape, craft brew by Shane Lenane of Blackbird Brewing, and metal sculpture artist awards created by Gail Chavenelle of Chavenelle Studio Metalworks. An artful evening indeed! As DubuqueFest Art Fair Director and Independent Contractor, Paula strives to develop arts programming that is viable and sustainable which provides economic opportunity for cultural workers. Her passion is to enrich the community through arts outreach. Press Release: 2017 DubuqueFest Arts, Wellness, & Music Programming Announced! New Year, New DubuqueFest Directors!